· Formal recognition of an individual’s professional achievement and competency. · Members are updated with the latest technical, environmental and commercial developments in the industry, through participation in Institute activities and by access to technical journals. · Free subscription to Quarry Magazine. · Networking with industry peers including quarry companies, suppliers, contractors and consultants. · Local and national access to technical meetings and symposia. · Special rate to attend continuing education activities including seminars, forums, conferences and luncheons. · Invitation to attend social events and gatherings. Membership application forms can be obtained by contacting the Secretary or any branch official or by email. Contact us here. The application form itself asks for details of your qualifications (if any), experience and responsibilities in the industry. This information determines the grade of membership which you will be accorded. In general terms the Institute membership grade forms a ladder of progress which can be climbed during the course of a career, starting with the entry grade of Student and leading to the highest grade of Fellow which has designatory letters FIQ. 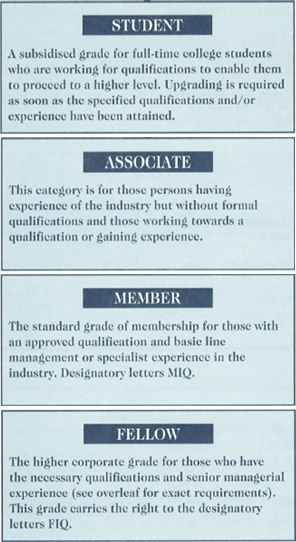 The Member grade is reserved for those with approved qualifications and basic line management or specialist experience in the industry. Designatory letters are MIQ. Applicants without any formal qualifications who are employed directly within the industry are given the standard grade of Associate. It is understood that such applicants will be working towards a qualification or gaining experience. The final grade is Student which is a subsidized grade for full-time college students who are working for qualifications to enable them to proceed to a higher level. Upgrading is required as soon as the specified qualifications and/or experience have been attained. Finally, applications may enter at any grade for which they have the appropriate qualifications and experience at any time during their career.